You can do your part to help local Special Olympics athletes by “Freezin’ for a Reason in 2019. It’s the Western Kentucky Polar Plunge & Polar 5K on Saturday, February 16th at Kentucky Dam Village State Resort Park. 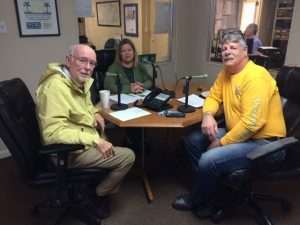 Alisia Stevens and Greg Hanisch with Marshall County Special Olympics were recent guests on WCBL’s Coffee Call program. Plunge participants solicit donations to support their effort (a minimum of $75 to take part or $50 for Junior Plungers). Polar Bears then take a teeth-chattering dip into the lake at Kentucky Dam Village State Resort Park. The Polar Plunge is extremely important to all of the athletes who compete locally in the Special Olympics. Hear the complete Coffee Call program by clinking on the link at the bottom of the home page at marshallcountydaily.com. For more information, you can email SpecialOlympicsMC@gmail.com.